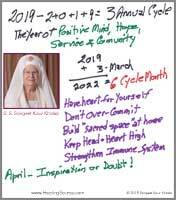 In the month of March we are in a 6 Planetary Cycle while evolving through this year’s 3 Annual Cycle. Read more: Yoga by the Numbers? Start Your Week Off with Sangeet’s Yoga Classes! Reiki Master-Trainer Sangeet Kaur Khalsa assisting a student with proper hand placement during a 2018 Reiki 2nd Degree Certification workshop. “I am so grateful and proud to be part of Sangeet’s strong Reiki lineage and am honored to be carrying this on to the next generation of Reiki healers and Masters I am training. Read more: "I'm Dreaming of a White"... New Year... In Phoenix, Arizona?